As we approach the gym, we hear laughing and the beautiful sound of children playing. Ajay turns his wheelchair – teenage mutant ninja turtle green in color, by his choice – adeptly to the left and steers it easily into the gym. He sees many familiar faces in the gym – not those of his classmates, but of his school mates, and he eagerly propels his chair towards them, his curiosity peaked. He wants to see what they are doing, and does not want to miss out on the fun. As I follow him closely, I see that these friends are walking and jumping and climbing and swinging easily and independently in the gym. Ajay quickly propels his wheelchair towards the group of children that are swinging on the platform swing. He loves to swing, and when he first started attending school and missed his family at home, it is the only thing that would console him. So it makes sense that his eyes gravitate towards the children that are enjoying his favorite pastime, so to speak. Or as our OT’s may call it, his favorite sensory experience. Never was there a better motivator for Ajay than his able bodied peers enjoying the gym, or enjoying a turn on what he might consider his own prized possession, the platform swing! So I know this is my chance to get him to work – and I offer him a chance to swing – but only if he will try to walk to get there. Ajay is up for challenge, so quickly we get to work. I retrieve his long leg braces and his walker from the hallway, and before long, Ajay is on the floor, cooperating easily with the tedious process of putting these braces on his legs. He is quite familiar with this routine, and I am amazed at his dedication. He does not refuse, cry or complain. He willingly complies with my requests to “scoot down” , “lie back” as I work to carefully don the braces and ensure a proper fit. All of a sudden, Ajay and I notice we have an audience. One little inquisitive boy named Ryan wants to get a closer look at Ajay’s long leg braces and even offers to help with the Velcro straps. Another friend Andrew asks freely “Why does Ajay need these braces?” . Their curiosity is obvious, their questions are matter-of-fact. After a brief explanation of why Ajay needs braces (“His muscles don’t work the way yours do, so he needs extra support to stand and walk”). 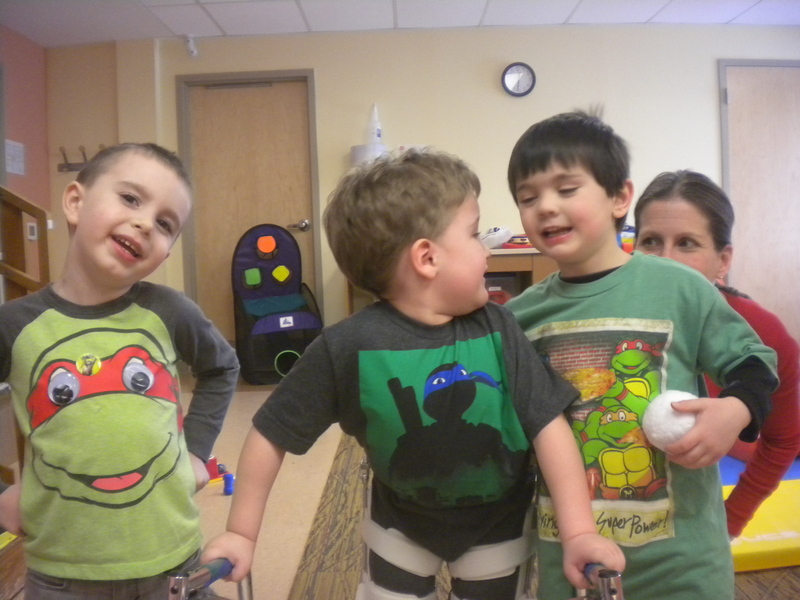 Ajay’s friends seem satisfied with these answers and turn their attention to more pressing matters – like the fact that all 3 boys are wearing Teenage Mutant Ninja Turtle shirts!!! All the boys seem to agree that Andrew’s shirt is the coolest because it has actual googly eyes glued to it! After agreement about the coolest shirt, it is back to work (and play) for Ajay. His friends Ryan and Andrew quickly jump up to their feet to head over the swing. Once I ensure that all of Ajay’s brace joints are locked for stability, I help him attain a standing position and he reaches out for his walker. It takes about 3-4 minutes for Ajay to take 10 steps with my help to reach his friends at the platform swing. Each step is a lot of work for Ajay. He has to lean on his walker with both arms and lift the weight of his lower body and long leg braces against gravity so he can swing them forwards. It is no easy task, but with his friends encouraging him from the swing, Ajay remains steadfast in his determination to walk. Little do his friends know how thankful I am to have them in the room – they are providing the motivation for Ajay to get up onto his feet! This entry was posted in child stories, Occupational Therapy and tagged Early Intervention, Easter Seals, Easter Seals Bucks Division, Easter Seals of Southeastern Pennsylvania, Occupational Therapy, physical therapy, social skills on March 24, 2015 by Easterseals.